A ball to be dropped under the Rules must be dropped by the player himself. He must stand erect, hold the ball at shoulder height and arm's length and drop it. If a ball is dropped by any other person or in any other manner and the error is not corrected as provided in Rule 20-6, the player incurs a penalty of one stroke. 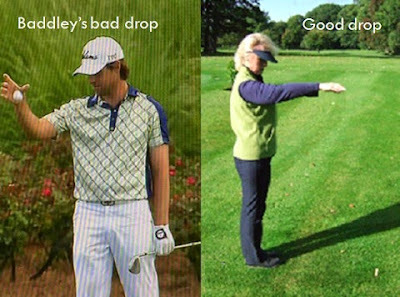 If only Aaron Baddeley was a regular reader of my weekly blogs he would have known better! This is a link to a similar breach by Sun Young Yoo that I wrote about in 2012. Sergio Garcia Didn’t Hole Out. Q. A competitor in a stroke-play play-off incurs a penalty of disqualification. Does the disqualification apply to the play-off only or to the entire competition? A. The disqualification applies only to the play-off. So, Sergio did not forfeit his $880,000 prize money, for equal second place, the same as Kevin Kisner, who subsequently lost out to Rickie Fowler’s birdie on the fourth play-off hole. Good news! My book '999 Updated Questions on the Rules of Golf 2014-2015' is available as a hard copy again. More information in next week's blog. So how many years has he been playing? Is this the first drop he has ever done? Is this the first drop he has done in front of the Rule Official? This of course is how he drops when he's with his mates, who don't know either. Slightly bent? What a load of cobblers! What should a player do if some physical obstructions like trees and bushes interfere the player from taking a proper drop. Can a player bend down or bend the arm and drop a ball in these circumstances? Q.A player drops a ball within the area prescribed by the applicable Rule. It bounces off a tree branch and as a result strikes the ground outside that area. What is the ruling? A.The ball struck a part of the course (the branch) where the applicable Rule requires (Rule 20-2b). Therefore, provided it does not roll into any of the positions listed in Rule 20-2c, it is in play and must not be re-dropped. In measuring the two club-lengths to determine if a re-drop is required under Rule 20-2c(vi), the point on the ground immediately below the spot where the ball first struck a part of the course (the branch) shall be used for measuring purposes.